(CNN) -- The young al Qaeda fighter must have stood out among the others creeping up a mountain on the Afghanistan-Pakistan border, trying to get a good vantage on a U.S. base. Though armed with rockets and on the same deadly mission as his comrades, he was an American -- out to kill the soldiers of his own country. Not long ago, he had been an altar boy, a kid growing up in a middle-class suburb on Long Island, New York, a teenager with a passion for baseball -- and the Mets. Now he was known by his Muslim name, Ibrahim, or by his fighting name: Bashir al Ameriki, "the American." It was September 2008, and it had been just a year since Bryant Neal Vinas, then 25, had left the United States in pursuit of a goal that became an obsession: to fight his fellow countrymen in Afghanistan. Vinas was arrested last year and confessed to assisting al Qaeda in a plan to bomb the Long Island Rail Road. He is one of 17 cases of American citizens and longtime residents of the United States implicated in terrorist activity in the last year, a surge in the rate with which such cases have emerged. At a time when U.S. counterterrorism officials are becoming alarmed at growing support for al Qaeda in the United States, Vinas' story sheds light on how and why some young American Muslims are becoming radicalized enough to want to kill in the name of al Qaeda. "There's clearly been an acceleration in radicalization in the United States," said Mitch Silber, the director of intelligence analysis at the New York Police Department. "Bryant Neal Vinas is almost a poster child for the process, the unremarkable nature of the people who might go through this process and frankly the potential to link up with al Qaeda and the danger that presents." "We've almost called Vinas the Forrest Gump of the jihad in the sense that he seems to find this way to get himself involved in operations or attacks that seem way beyond [what] a 20-some odd convert from Long Island should be involved in," Silber said. Unlike some of the Americans linked to terrorism plots, Bryant Neal Vinas was not a naturalized citizen. He was born in Queens, New York, and grew up in Medford, a suburb just off the Long Island Expressway. His father, Juan, was an engineer from Peru who immigrated to the United States four years before Bryant was born, on December 4, 1982. His mother, Maria Luisa, was from Argentina. Vinas' sister, Lina, is three years younger than he. "What happened to our family could happen to any American family and we want to do what we can to warn other families," said Vinas' mother, who spoke to CNN in the family home in Medford, where she still lives with her daughter. His mother describes Vinas as a sweet, charming, young child with a kind heart. "He would fix me breakfast in bed if I was sick," she recalled. Lina Vinas, who works as a caregiver, says she was very close to her brother when they were young. At school, he was "protective of me," she said, and popular with his teachers. She recalled he also saved her from drowning once when she ventured to the deep end of a swimming pool. Lina and her brother were raised Catholic at the insistence of their father. Bryant was an altar boy and often was asked to read the scriptures during Sunday services, Lina recalled. Though he had many hobbies -- piano, guitar and Japanese anime -- his one constant passion was baseball. During high school, he was on the junior varsity team. "He took baseball very seriously. Seriously enough to bike ride to high school -- which would take half an hour -- to practice," said Carvin Desroches, who lived a few houses from the Vinases and has known Vinas since he was age 8. But Vinas' happy childhood ended when he was 14 and his father left his mother for another woman. "He never accepted it," his mother said. "He cried and screamed. He had a huge temper." Not long afterward, Vinas started acting out, becoming increasingly rebellious and disrespectful. Eventually, Bryant's mother gave up custody of him because he became too much to handle. He later moved in with his father. He grew his hair long and got into rap music, especially Big Pun, a Puerto Rican rapper whose lyrics were expletive-filled, violent and sexually charged. "He thought R&B was for sissies," Desroches recalled. His lifestyle could not have been more different than his taste in music. As a teenager he rarely got into fights, never drank alcohol and did not have a reputation for chasing after girls, according to his friends. At 16, he became interested in evangelical Christianity, his mother said, and sometimes asked her to drive him to a nearby church. "Bryant seemed to be searching for something," she said. His father's infidelity, one person close to Vinas said, had left him disillusioned with Catholicism. At Longwood High, a massive school where it is easy for a student to get lost in the crowd, Vinas kept to himself, often wandering the halls alone, according to classmates. "We just clicked like regular buddies," he said. "I showed him openness and I believe that's why we became so close." They were in some ways opposites. "He was not caught up with going out partying. He was always straight edge. I never had a beer with him. ... He always did his homework on time," Acevedo recalled. Acevedo and Vinas became part of a small, tight-knit group, several of whom were of Puerto Rican descent. Vinas had a reputation for being gullible, said one of those friends, Roberto Dillan. "If you told him that Toyota was the best car but he really liked Mazdas then maybe he'd go for the Toyota. He was easily swayed. Maybe that's what happened with the religious aspect later." When planes piloted by al Qaeda hijackers struck the twin towers of the World Trade Center on September 11, 2001, Vinas had just graduated from high school. Like so many other young Americans affected by that seminal event, he would soon join the Army. "He just felt proud," Acevedo recalled. But others thought he may have been influenced as much by his friends' aspirations as his own sense of public duty. "He did not stand out as being patriotic or anti-patriotic," said Dillan, who with another friend of Vinas' joined the Coast Guard. Vinas did not last long at boot camp. His military records, obtained by CNN, show he spent one month in infantry training at Fort Jackson, South Carolina, between March 12 and April 11, 2002. The records do not indicate why he was discharged, but according to family members it may have been that he suffered from asthma. "He said it was good at one point but ... too difficult for him," Acevedo said. Vinas was dispirited when he returned to Long Island. He began to spend time with Acevedo's half-brother, Victor Kuilan, who converted to Islam at 16 and was an aspiring professional boxer. "He started asking me all sorts of questions" about Islam, Kuilan recalled. To satisfy his friend's curiosity, Kuilan handed Vinas an English language version of the Quran. Kuilan said he warned Vinas that converting to Islam would lead to further tensions with his family. According to Acevedo, it took Vinas only two days to read the Quran. Just a few weeks later, he converted. Without telling either Acevedo or Kuilan, Vinas recited the Shahada, the Muslim profession of faith, at the Al Falah mosque in Corona, Queens. The mosque, run by the Muslim missionary movement Tablighi Jamaat, would have been familiar to Vinas as it was just a few doors away from the house his parents were living in when he was born. "He simply told me he had changed his religion, that was it," Vinas' father recalled. "Early on, he tried to persuade me to convert, too." "The Tablighi Jamaat took a strong hold of Bryant," Kuilan said. Vinas would often drive up to New York City to take part in the group's missionary work, going out into neighborhoods and knocking on doors. The Tablighi Jamaat is a worldwide movement with hundreds of thousands of followers. Although largely apolitical, its followers have a reputation for zealousness, which counterterrorism officials worry can make them vulnerable to radical influences. Closer to home, Vinas started attending the Islamic Association of Long Island Masjid in Selden, a mosque widely regarded as espousing a mainstream interpretation of Islam. Niamatullah Ibrahim, the mosque's caretaker, would become his closest friend at the mosque. Ibrahim said Vinas did not like to speak about his conversion. But Kuilan, who also attended the Selden mosque, said Vinas plunged himself into his new religion with the zeal of a new convert, praying five times a day and refraining from eating pork. The rules and regulations of Islam seemed to fit his personality. "He was always straight-edge, even before he was a Muslim," Kuilan said, "[so after he converted] he was still the same Bryant that everybody knew." Roberto Dillan agreed Vinas was his normal friendly self at first. But by the time Dillan left for the Coast Guard in December 2002, Vinas' increasingly fervent views had soured their friendship. On one occasion Vinas reprimanded Dillan for cooking pork. On another Vinas snapped during one of their discussions, "What did Jesus ever do for me?" Around 2004, Vinas started working as a forklift truck operator. He was also growing increasingly passionate about boxing, often sparring with Victor Kuilan and other young Muslim boxers. But he was growing increasingly restless on Long Island. "He always wanted to travel, to get away. He would actually eat cereal, day in, day out, just so he could save," Acevedo said. A financial settlement from a leg injury in a forklift truck accident, Acevedo said, gave Vinas the funds he needed to travel. His plan: to go to Cuba, where he hoped to receive additional boxing training. Vinas made two trips to Cuba, gaining entry illegally, and spent several months there, according to Acevedo. They were trips that Vinas relished. Cuban women warmed to him much more than American girls ever had, he told Acevedo. They were easily enticed by simple gifts such as the hair conditioner and lingerie he brought from the United States. Vinas' conversion to Islam had changed his lifestyle in many ways, but had not affected his sexual desires. "Going to Cuba was a way to get his fill," Acevedo said. The trips to Cuba foreshadowed his travel to al Qaeda's camps in Pakistan, according to the NYPD's Silber. "It's almost a challenge for him. Extreme travel had some sort of appeal to him, being almost a countercultural type of approach." Vinas was not able to return to Cuba a third time and was forced to end a relationship he'd begun with a young woman there, he would later tell investigators. She was the daughter of a boxing instructor, and they'd begun to share an apartment. "It hurt him a lot that he had to tell her that they couldn't be together no more," Acevedo recalled. Back on Long Island, Vinas approached his Muslim faith with renewed vigor. "He would spend all his time in front of the computer, reading the Quran and accessing religious websites," his father recalled. "He was also learning Arabic on the computer through discs that he had purchased." It was during this time that Vinas became disillusioned with the apolitical worldview of the Tablighi Jamaat and attracted to a more "hard-line" interpretation of Islam. He began spending time at the Selden mosque in the company of Ahmad Zarinni, who took Vinas under his wing, according to one mosque member. The son of Afghan parents who immigrated to the Selden area, Zarinni attended high school on Long Island and studied at the local Stony Brook University, according to records obtained by CNN. But by all accounts, he never integrated into American society. He worked part time at a cell phone store owned by a mosque member but quit after the owner refused to stop selling ringtones. Zarinni, according to the owner, regarded music as "haram," prohibited by Islam. The chairman of the Selden mosque said Zarinni's application to teach children there was turned down because of concerns about his fundamentalist views. Vinas, meanwhile, was starting to surf extremist websites. "There's still a lot of questions about precisely what he was doing on the internet, but certainly there's evidence to believe that he [was] getting encouragement on these websites that jihad was permissible," the NYPD's Silber told CNN. Acevedo said the websites contributed to Vinas' emerging conviction that the United States was at war with Islam. Acevedo remembered him as "always pissed off, always mad." Although he could not recall Vinas surfing any jihadist sites, he said Vinas became obsessed with online conspiracy theories such as one that said the United States, not al Qaeda, was responsible for 9/11. A YouTube video that Acevedo said Vinas viewed alleged that the Federal Emergency Management Agency was planning to round up Americans and place them in concentration camps. Vinas, Acevedo said, became convinced that Muslims would be the target. "He was scared eventually he would be put in a concentration camp because of the way he thought. It was telling him to get out, get out of the country." One day the caretaker at the Selden mosque was sitting next to Vinas in the public library and saw that he was staring at his computer, mesmerized by an account of Joseph Cohen, a Jew who converted to Islam. Known by his Muslim name, Yousef al Khattab, Cohen was then the chief ideologue of the Islamic Thinkers Society, an extremist group supportive of al Qaeda and based in New York, according to counterterrorism officials. Vinas' friend Zarinni was already part of the group. Soon, Vinas too would be moving in its circles, a path that would lead to al Qaeda's camps in the mountains of Pakistan. Preaching jihad in the U.S. The Islamic Thinkers Society has not faced restrictions in spreading its message within the United States because of freedom of speech protections. "As much as the Islamic Thinkers Society might put out an extremist message, it seems they go right up to the line of the First Amendment. For the most part, they themselves as a group aren't acting," said Silber. Terrorism experts believe that groups like the Islamic Thinkers Society are dangerous nonetheless. "Even if they do not have the connections to help [young radicals] go further, they articulate the glory of fighting jihad," said Marc Sageman, a former scholar in residence at the NYPD. CNN located online video footage of Zarinni participating in Islamic Thinkers Society rallies in Manhattan in June 2005 and February 2006. Such overt displays of militancy increasingly put Zarinni on the radar of U.S. counterterrorism officials, who described him as becoming a leading figure in the group. Zarinni has refused to answer CNN's questions about his participation in Islamic Thinkers Society rallies and his friendship with Vinas. Officials say it was Zarinni who introduced Vinas to the Islamic Thinkers Society. At the Islamic Thinkers Society, Vinas would get to know one of its followers, Ahmer Qayyum. U.S. counterterrorism officials said Qayyum, a Pakistani national, would play a key role in Vinas' journey to al Qaeda camps in Pakistan, something Qayyum denies. CNN tracked down and interviewed Qayyum in Lahore, Pakistan. When Vinas met him, Qayyum had been living in New York for several years, having come to the United States to pursue his education. He was by no means radical himself during his first years in the United States. Between 2002 and 2004, he attended the William Esper Studio, a prestigious acting school in Manhattan whose graduates include Hollywood stars such as Jeff Goldblum, Larry David and Gretchen Mol. Acquaintances there said Qayyum was not then overtly religious. In fact they recalled that he attended the school in defiance of his father back in Pakistan, whose traditional views meant he frowned upon acting as a career. After graduating from William Esper and struggling to land any acting jobs, Qayyum became much more fervent in his religious beliefs. In 2006, former classmates received long e-mails from Qayyum imploring them to convert to Islam. By then Qayyum had grown his beard long and was regularly taking part in Islamic Thinker Society protests in New York. What drew Qayyum to the Islamic Thinkers Society was his anger over U.S. wars in Afghanistan and Iraq and U.S. support for Israel, he said. "They [the U.S.] are attacking the Muslim countries for their goods, for their resources and I mean they [the Islamic Thinkers Society] were pretty vocal about it and I liked them for that," Qayyum told CNN. "The evil American empire is not going to last too long, inshallah." Friends said they believe Vinas was brainwashed by extremists. "Somebody put the bug in his ear," said Acevedo. Another said Vinas was not happy because of tensions with his family and lack of full-time employment, making him easy prey. The Islamic Thinkers Society and other like-minded groups have been a concern to U.S. counterterrorism officials for several years. "In a sense they are almost bug lights for aspiring jihadists," Silber said. Qayyum said Vinas started hanging out in Islamic Thinkers Society circles but said Vinas was not as active in the group's activities as others. Qayyum said that he met Vinas through Zarinni and the three of them became very close. U.S. counterterrorism officials said they were able to establish that Vinas had attended several meetings of the Islamic Thinkers Society. The "chief ideologue" of the Islamic Thinkers Society during this time was Khattab, the American Jewish convert to Islam whose story had intrigued Vinas. Khattab had close connections to two of Vinas' friends, Qayyum and Zarinni. Khattab told CNN that he knew Zarinni well, even helping arrange a marriage-match for him. Zarinni was regarded as extremist even within Islamic Thinkers Society circles, Khattab said. Khattab acknowledged meeting Vinas but said it was only once or twice. Counterterrorism officials said they believe Khattab met Vinas on several occasions. "Vinas was looking for someone who could provide him guidance. And in that role, Yousef al Khattab was the person to go see," said Silber. Khattab denied he shaped Vinas' worldview, but makes no secret of his own sympathy for al Qaeda. "I love Osama bin Laden like I can't begin to tell you," he said. Eventually, Vinas' views led to a confrontation with Ibrahim, the caretaker of the Selden mosque. Three friends in Vinas' Muslim circle told CNN in separate interviews that Vinas told the caretaker he wanted to travel overseas to fight jihad. Ibrahim said he does not recall that conversation, only that Vinas said Muslims should go fight against Israel. As a result of the confrontation, according to Vinas' friends, he stopped going to the Selden mosque. He began hanging out with friends, including Victor Kuilan and Acevedo, at a mosque in a wooded area of Coram, Long Island. Kuilan said Vinas often vented his anger over U.S foreign policy. "Nothing was taboo," he said, "and I didn't disagree with everything that Bryant was saying." Vinas was so immersed in extremist ideology, Kuilan said, that he took up Osama bin Laden's injunction to stop paying U.S. taxes so they would stop funding America's war on Islam. What agitated Vinas most of all, Kuilan said, was U.S. support for Israel. Kuilan said he eventually became alarmed at Vinas' increasingly radical views and distanced himself. When Vinas began to express the desire to travel to Pakistan to join jihadists, Kuilan said, he never thought Vinas would actually follow through. "To fight American soldiers, yeah ... it was on his mind," Acevedo said. "I didn't take him serious, though ... I didn't think he was going to go kill somebody, you know. I didn't think it could be that simple, that you could be like, 'OK, the [U.S.] military is really aggravating me. Let me go to Pakistan.' "
Vinas was on a mission: to find the connections he needed to hook up with militants in Pakistan. In summer 2007, he traveled to Atlantic City to visit Khattab, who had moved there from New York for a few months. "I suspect that he was asking him for connections, for names in Pakistan," a U.S. counterterrorism source told CNN. If this was the case, Vinas may have been disappointed. Counterterrorism officials said they believe that although Khattab may have inspired Vinas, he likely did not have the contacts Vinas needed. Khattab said Vinas never spoke to him about wanting to go to Pakistan or to fight overseas. Khattab said Vinas came to Atlantic City with some "brothers" to meet with him and hear the story of how he converted from Judaism to Islam. "He [Vinas] gave me a big hug when I met him," Khattab recalled. "We ate shrimp in an Atlantic City shrimp bar and walked along the boardwalk." Khattab refused to divulge who the "brothers" accompanying Vinas were. "I don't kiss and tell," he said. U.S counterterrorism officials said they believe Vinas became frustrated with leading figures within the Islamic Thinkers Society. "The pattern we see is a lot of these [radicalized] individuals at a certain point realize that these groups are just talkers," said Silber. "And those that are serious about the jihad will leave these groups." But there was one Islamic Thinkers Society follower who allegedly had the connections Vinas needed. U.S. counterterrorism officials said Vinas' Pakistani friend, Ahmer Qayyum, agreed to help him. Qayyum denied it. Counterterrorism officials said they believe their mutual friend, Zarinni, also knew of Vinas' plans. In an interview with CNN, Qayyum acknowledged that he and Vinas made plans to fly to Pakistan in September 2008, but said Vinas wanted to travel to Pakistan to study Islam and be treated for back pain. "He was in severe pain, lower back, and I knew about this guy [in Pakistan] who used to cure people." Qayyum said. In the weeks before his departure, Vinas dropped all talk of fighting jihad with his close friends on Long Island. We've almost called Vinas the 'Forrest Gump' of the jihad. "He came to me and asked me my opinion about whether he should go to a madrassa in Pakistan ... and if I wanted to go with him," Kuilan recalled. In retrospect, he said he thinks Vinas was masking his true intentions. With his travel plans made, Vinas seemed happier. Kuilan recalled Vinas' "whole demeanor lightened up." Acevedo remembered going to a gun range with Vinas. "We probably shot a good 200 rounds," he recalled. "He just felt free." Two weeks later, Vinas told Kuilan goodbye, saying he was going to study in Pakistan. Vinas' farewell to Acevedo was more emotional. As a parting gift, Vinas left him a book, "Inside the Jihad," about a French spy who claimed to have infiltrated al Qaeda. It was then that Acevedo understood Vinas' true intentions. "I asked him, when are you coming back?" said Acevedo. His best friend's response still haunts him: "I'm not coming back. I will call you in your dreams." 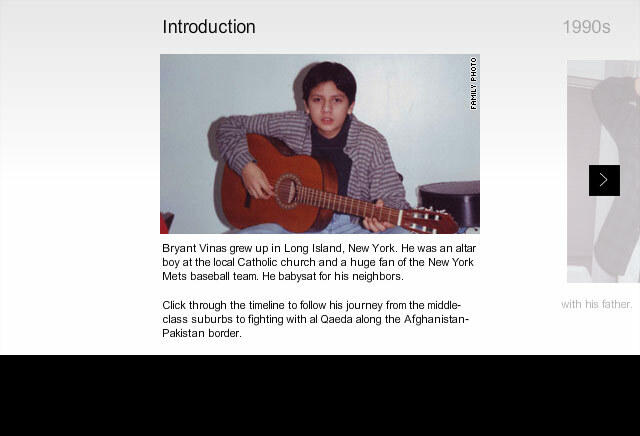 An interactive timeline of Bryant Vinas' life, from altar boy to al Qaeda member. An analysis into why some terror suspects cast off a life of comfort and drift toward extreme views before embracing political violence inspired by a sense of grievance or alienation.